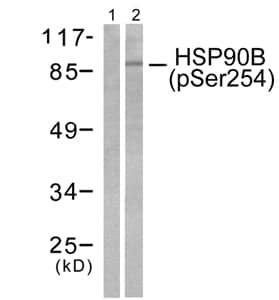 Detects endogenous levels of HSP90B only when phosphorylated at serine 254. Synthesized phosphopeptide derived from human HSP90B around the phosphorylation site of serine 254 (V-G-SP-D-E). Our Abpromise guarantee covers the use of ab51136 in the following tested applications. WB 1/500 - 1/1000. 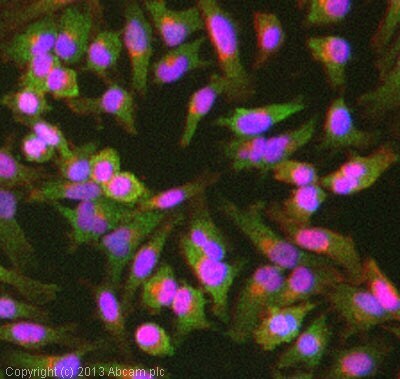 Detects a band of approximately 87 kDa (predicted molecular weight: 83 kDa). 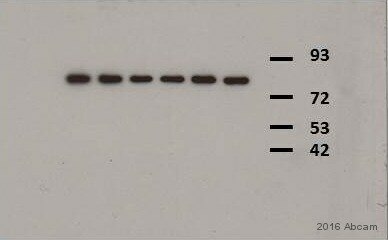 Lysates/proteins at 0.02 µg/ml per lane. 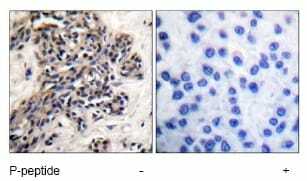 Ab51136 at 1/50 dilution staining human breast carcinoma tissue with and without blocking peptide; paraffin embedded. ab51136 has not yet been referenced specifically in any publications. Publishing research using ab51136? Please let us know so that we can cite the reference in this datasheet. Thank you for your inquiry. I can confirm that the immunogen peptide amino acid range for ab51136 is amino acid 245-275 and for ab63562 is amino acid 220-250. I hope this information is helpful and wish you good luck. PS. I send you a quote for both products in a separate email. Both antibodies are in stock at the moment and will be delivered the next day within the EU if ordered before 14:30.